Fed Chair Janet Yellen struck a surprisingly dovish tone in her testimony before Congress. She told lawmakers that the central bank could still adjust its policy, if the recent undershoot in inflation continues. 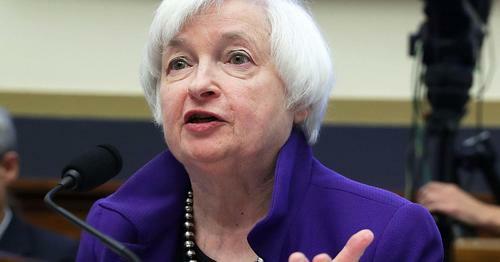 But Yellen added that the U.S. economy warranted a gradual rise in rates. 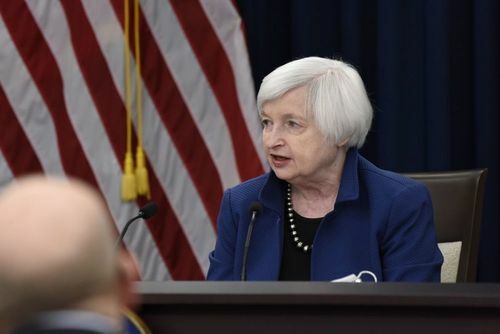 The Committee continues to expect that the evolution of the economy will warrant gradual increases in the federal funds rate over time to achieve and maintain maximum employment and stable prices. That expectation is based on our view that the federal funds rate remains somewhat below its neutral level, that is the level of the federal funds rate that is neither expansionary, nor contractionary and keeps the economy on an even keel. CNBCIn remarks for her testimony on Capitol Hill, she said that the balance sheet, eventually will be "appreciably below" its current level. 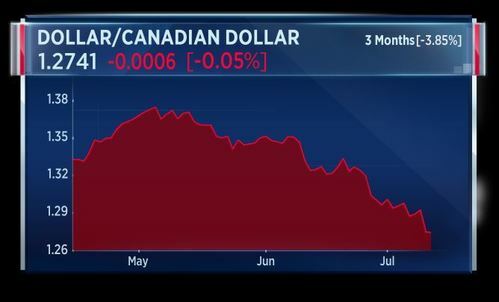 The Canadian dollar hit its highest level in over a year, after the Bank of Canada raised rates for the first time since 2010. Lenders in the country quickly hiked prime rates by a quarter of a percentage point, matching the central bank's move. This makes the B-O-C the first major reserve bank to follow the Fed in tightening. 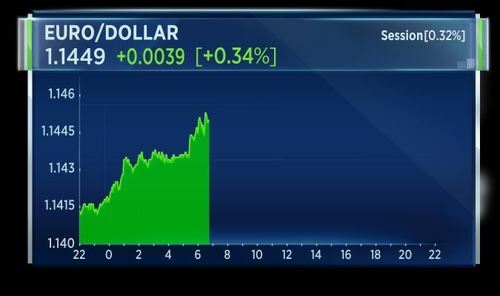 Stocks rally around the world as Fed chair Janet Yellen strikes a slightly less hawkish tone than expected, emphazing her concerns about low inflation. 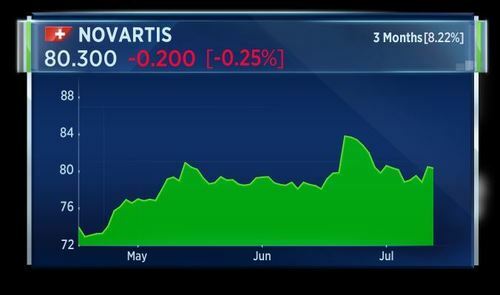 Novartis wins support for a pioneering cancer medicine, as a recommendation to the FDA could pave the way for approval of the first US gene therapy. Brazil's former president Luiz Ignacio Lula is sentenced to nearly 10 years in prison on corruption charges, boosting Brazilian stock markets. Chinese exports came in higher than expected in June. Global demand powered an 11.3 percent year-on-year increase. Analysts expected just under 9 percent. Imports also rose at a faster pace than forecast, growing 17.2 percent year-on-year. The report also showed Chinese trade with North Korea rising over 10 percent in the first half of this year. 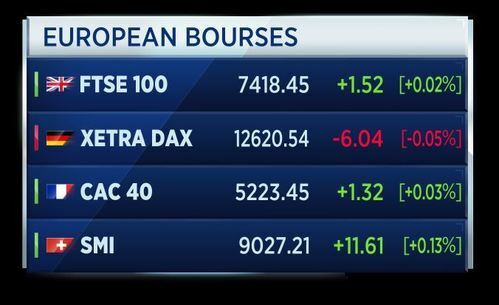 Stocks rally around the world as Fed chair Janet Yellen strikes a slightly less hawkish tone than expected, highlighting her concerns about low inflation. Germany's consumer prices, harmonised to compare with other European countries, rose by 0.2 percent in June from the previous month and by 1.5 percent from the previous year, the Federal Statistics Office confirmed on Thursday. On a non-harmonised basis, consumer price inflation for June was also confirmed. The national index was up 0.2 percent from May and rose by 1.6 percent from the previous year. Karen takes us through markets and looks at the aftermath of Yellen testimony. 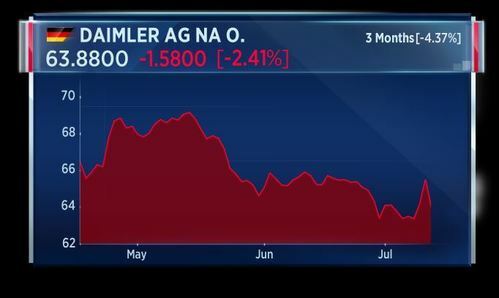 Shares in Daimler indicated down more than 4 percent. German carmaker Daimler has been accused of selling over a million cars with excessive emissions in Europe and the United States, Sueddeutsche Zeitung newspaper said on Wednesday, citing a search warrant issued by a Stuttgart court. Russia central bank chair Nabiullina says global economy faces new cyber risks that threaten financial systems, economic growth. Nabiullina says structural reforms are needed urgently for stronger economy. Online fashion retailer Asos has posted retail sales growth of 32 percent in the four months to the end of June. They booked a total of 660 million pounds. Asos saw U.K. sales increase by 16 percent and international sales up 44 percent. 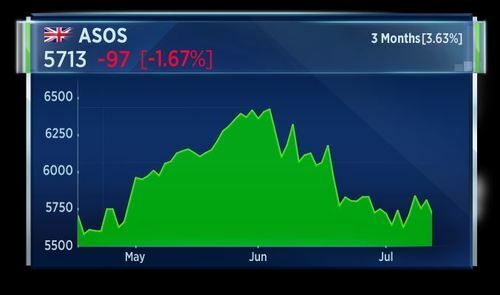 Asos said it expected full-year pretax profit to be in line with the market consensus - 79.4 million pounds. French final June EU-harmonised CPI rises 0.8 percent year on year. This is unchanged from the flash estimate. 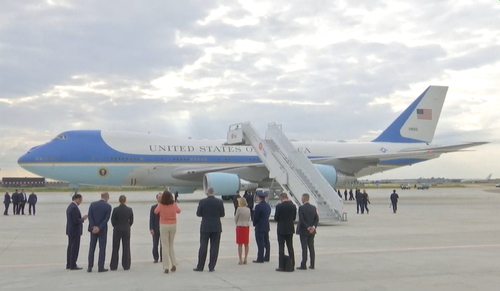 Air Force One has arrived in France. U.S. President Donald Trump is visiting Paris for a two-day trip. He was invited by President Emmanuel Macron to attend the Bastille Day celebrations. 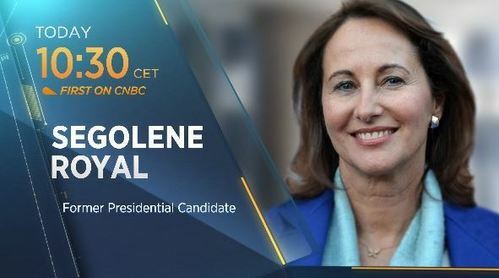 CNBC will be discussing Trump's visit to Paris with Segolene Royal, the President of COP 21 and a former French Presidential candidate, later this morning. Spain's final reading of June CPI inflation is 0.0 percent month on month, matching forecasts. It fell 0.1 percent in May, according to INE. June's final EU-harmonised reading of CPI is up 1.6 percent year on year and 0.1 percent month on month. 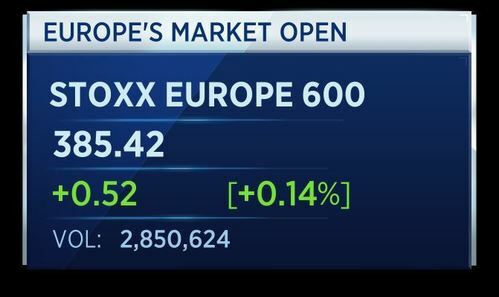 Major market indexes have opened mixed across the board as investors eye new earnings reports and look ahead to more comments from U.S. Federal Reserve Chair Janet Yellen who will testify to Congress for a second day. Malaysia's central bank keeps its overnight policy rate at 3 percent. The central bank says the stance of its monetary policy is accommodative and supportive of economic activity. The central bank says headline inflation is 3.9 percent in May, and is expected to moderate in the second half of the year. German carmaker Daimler has sold more than 1 million cars with excessive emissions, this according to a report from Sueddeutsche Zeitung. Citing a search warrant issued by a Stuttgart court, the report says models with excessive emissions were sold from 2008 to 2016 in both Europe and the United States. A spokesman for the automaker declined to comment on the investigation to CNBC, but said that it planned to co-operate fully with the authorities. SAP has opened an investigation into its South African unit after local media reported the technology company paid kickbacks to a firm linked to the politically prominent Gupta family. The German technology firm has put four senior executives on leave, and has hired an international law firm to conduct a probe into the allegations. 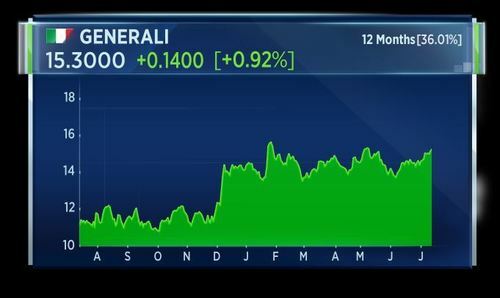 Generali is looking to sell its 44 billion euro life insurance portfolio in Germany. That's according to Reuters, which reports that the sale would be part of a restructuring in Europe, and one of a number of strategic options being weighed by the Italian insurer. A new cancer gene therapy from Novartis has won support from an FDA panel. The backing paves the way for the first US gene therapy, which would treat a form of leukemia. The treatment is given just once, and is expected to cost up to 500-hundred thousand dollars. Online fashion retailer Asos has posted retail sales growth of 32 percent in the four months from March to June, a total of 660.1 million pounds. Asos saw U.K. sales increase by 16 percent and international sales up 44 percent. The retailer is forecasting sales growth for the full year at the upper end of its 30 to 35 percent guided range and full year pretax profit of 79.4 million pounds. George Galliers, autos analyst at Evercore ISI, says Daimler has been in talks with the U.S. EPA with regards to its diesel engines following the Volkswagen emissions scandal. We would like to point out that the fact that our questions around OECD devices in diesel engines, questions around real-world emissions, none of this is actually new. From a U.S. perspective we’ll wait and see, but as I said, Daimlar has been in discussions with the authorities for some time now. 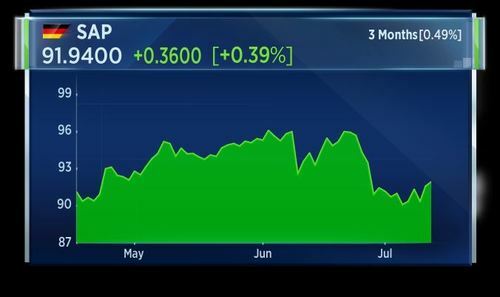 Galliers recommends Volkswagen among European automakers as its underlying earnings can continue to surprise to the upside. Swiss producer/import prices fell 0.1 percent month on month in June, versus a fall of 0.3 percent the month before. Year on year, prices fell 0.1 percent in in June from growth of 0.1 percent the month before. CNBC's Steve Liesman has the full report on Janet Yellen's testimony. These are the top headlines half an hour into Thursday's market session. Not immune to that! 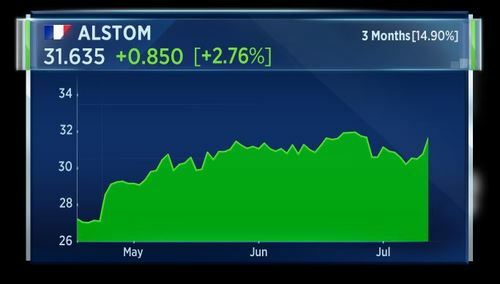 Astra Zeneca falls to the bottom of the Stoxx 600 on a report that the UK pharma giant's CEO Pascal Soriot is planning to jump ship to run Israeli generic drugmaker Teva. Daimler shares take a hit, following a report the German carmaker sold more than a million cars with excess emissions. President Trump arrives in France for a Bastille Day visit, just as the Russia controversy heats up back home. Swden's June CPI inflation rises 1.7 percent year on year, higher than the 1.6 percent forecast. Month on month it rose 0.1 percent, against a forecast fall of 0.1 percent, according to the country's statistics office. 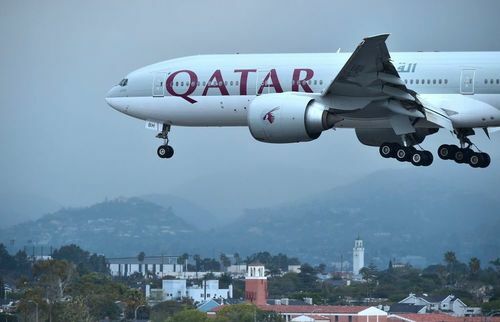 Qatar Airways' CEO has said it still plans to purchase a stake in American Airlines, despite the U.S. carrier ended the code-share agreement. The company's CEO said he was disappointed by the decision, but that the company would work with other partners in the United States. Meanwhile, Qatargas has asked its suppliers to set up local operations in Qatar, in a bid to get around sanctions imposed by its Arab neighbours. The state-run company, which is the world's largest LNG producer, said the decision was taken in order to cut the response time for providing materials and service. 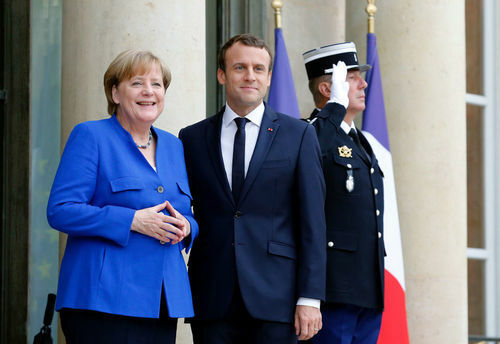 German Chancellor Angela Merkel has arrived at the Elysee Palace for a joint cabinet session with President Macron. According to the Handelsblatt newspaper, the German and French finance ministers will propose a plan to harmonize the two countries' corporate tax policy. U.S. President Donald Trump has also landed in Paris. He is in town to celebrate Bastille Day. Reporting for CNBC, Claire Fournier says this is a "classic" Macron technique of trying to engage with those he may disagree with and try to convince them he is right. What they want to achieve today in the close circles of the President is get off with a new, fresh start with the American president, since there first encounters were a bit weird. They will probably seek to work together on important topics such as counter terrorism and Syria and they will leave aside most probably the dividing issues such as trade. Oil investors are going through a period of waning confidence. That's according to the latest report by the International Energy Agency. The organisation suggests that growing impatience over the re-balancing of the oil market is to blame for money managers slashing long positions in crude futures. The IEA also said that global demand growth rebounded in the second quarter, and called on investors to wait a little longer to find out if the re-balancing process has begun. 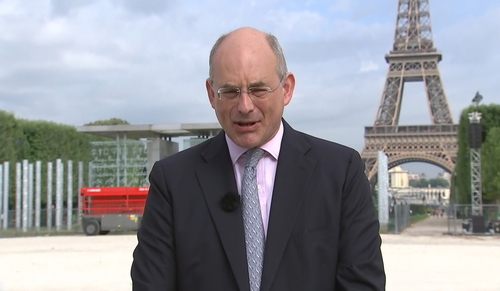 Neil Atkinson, head of the oil industry and markets division at the IEA, says the rebalancing of the market is on the way. At the moment we’re slightly at the mercy of statistics, waiting for the statistics to catch up with what we think is happening out there. The rebalancing is happening, it’s just a question of seeing that the recent increase in demand, very strong in the second quarter, is going to assert itself. 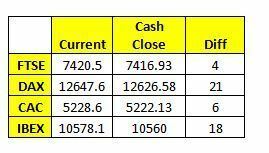 That would mean there would be a deficit in the market as we move through the rest of the year. The latest IEA report on how the oil market performed in June has been released. It found that crude output rose by 720 million barrels a day in June across the world. Output increased 340 million barrels a day in OPEC countries. Meanwhile, oil prices dropped on average $3 to $4 per barrel in June. 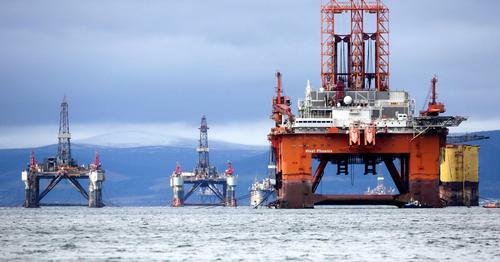 Global oil supply rose in June despite an ongoing deal to cut output, the International Energy Agency noted in its latest market report on Thursday. Shares in AstraZeneca are trading near the bottom of the Stoxx 600, on a report the UK pharma company could lose its CEO to generic rival Teva. According to the Calcalist financial website, Pascal Soriot has met with the Israeli company's search committee, and agreed to join as its new chief executive. Meanwhile, a new cancer gene therapy from Novartis has won support from an FDA panel. The backing paves the way for the first US gene therapy, which would treat a form of leukemia. 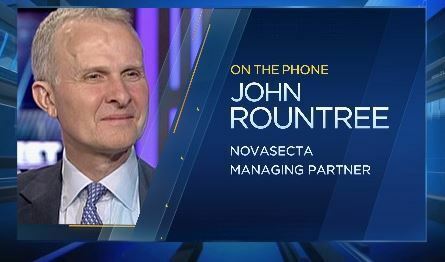 John Rountree, managing partner of Novasecta, says this is very significant. Gene therapy has been a long time coming. It’s a complex technology, it’s very difficult to pull off and hats off to Novartis for getting this panel approval. Gene therapy has still got a long way to go. There are competitors behind; there are still some side-effects. I think it’s just good for patients and good for the industry that its showing it can continually innovate. On the topic of side-effects, John says al drugs have some form of side-effect and no treatment is perfect. He says many patients will take the risk as gene therapy can treat life-threatening conditions. China's 2017 GDP growth is seen edging up to 6.6 percent and to 6.3 percent in 2018. This compared to actual GDP growth of 6.7 percent in 2016. Meanwhile, China's central bank says it is keeping benchmark interest rates steady through at least Q4 2018. These are the top headlines for the hour. Not immune to that! Astra Zeneca falls to the bottom of the Stoxx 600 on a report that the UK pharma giant's CEO, Pascal Soriot, is planning to jump ship to run Israeli generic drugmaker Teva. The Bank of England says banks expect a slight fall in the availability of mortgage lending in Q3 driven by declines in high loan-to-value lending. This as demand for mortgage lending is expected to rise in Q3. Also, the central bank says banks expect a decrease in the availability of unsecured housing credit in Q3 due to a changing appetite for risk and a changing economic outlook. Banks are expected to further tighten standards for credit cards and other unsecured lending. Credit to the corporate sector is expected to remain unchanged in Q3. New contracts in North America helped Alstom post a 6 percent rise in first quarter sales. The French train maker maintained its 5 percent organic growth outlook and said it expected its EBIT margin to hit 7 percent by 2020. 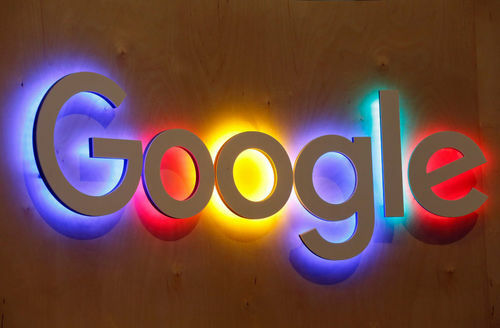 Google won't be liable to pay over 1 billion euros in back taxes to French authorities. A court there ruled in favour of the tech giant, saying it doesn't have sufficient presence in France to justify the bill. The decision follows a six-year-long legal battle over back taxes claims for the years between 2005 and 2010. China's power consumption in June increased 6.5 percent on the year, reaching 524.4 billion kilowatt hours, according to the Energy Administration. President Trump's nominee for FBI director faced a Senate confirmation hearing this week. The former head of the agency was fired by the president. NBC's Justice Correspondent Pete Williams has more. Despite the weaker pound, the U.K.'s appetite for travel doesn't seem to have diminished. Visits abroad by U.K. residents rose 8.1 percent year on year in the first quarter, according to the ONS.